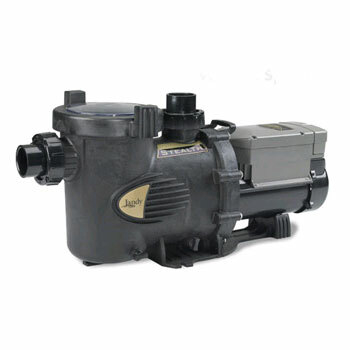 Variable speed pool pumps are all the rage. Fantastic energy savings an whisper quiet operation are the two most cited reasons for interest in the product. Comparing variable speed pumps is important because there are a wide range of prices and installation service levels available. All will save you money, but the features and capabilities vary widely. Selecting the right pump for your pool is critical. While not a solar product, per se, variable speed pool pumps compliment solar pool heaters and become an integral part of a solar pool heating system. It’s critical to understand the comparisons to ensure a variable speed pump will work with your solar pool heater (or heat pump or gas heater for that matter). Here are the most popular variable speed pumps we are seeing on the market in Southwest Florida. This is my favorite of the bunch. I have this pump, and have loved it from the day I installed it. It is whisper quiet at low speeds, energy efficient at all speeds, and has excellent connectivity for Pentair automation products. The Pentair IntelliFlo is a 3 HP motor coupled with a variable speed drive with fully programmable speeds and schedules. It has four speed buttons and eight programs. It communicates with Pentair automation products like the SunTouch, SolarTouch, EasyTouch, or IntelliTouch via an RS-485 digital interface. If connecting the pump to non-Pentair automation, it requires an Intellicom II digital interface. However, certain versions of the popular Aqualink system with newer firmware can natively control the Intellicom as long as you have a PDA remote (I should mention that this is not supported by Pentair). When controlling the IntelliFlo with a Pentair automation (excluding the SolarTouch or Intellicom II) or Aqualink PDA, the controller will take over control of the pump and all schedules and speeds are controlled externally. One disadvantage of external control is that the IntelliFlo no longer displays the operating speed or energy use on the integrated display. Fortunately you can get this information through the automation product, but it’s not as convenient when standing over the pump. 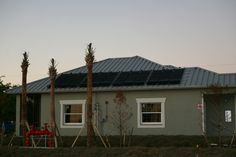 With the SolarTouch controller and Intellicom II, the pump retains all of the scheduling, speed, and display functionality, and the SolarTouch simply overrides the currently selected speed when solar heating is active. The IntelliFlo also comes in a SVRS (suction vacuum release system) version to comply with the Virginia Graeme Baker Act and Florida Building Code for some pools. The EcoStar is also a capable variable speed pump. It features a 2.5 HP motor with an onboard drive/controller with similar features to the IntelliFlo pump. There are four speed buttons and eight schedules. The Ecostar connects to automation products a little differently, with an analog interface. When connected to automation, the pump is capable of eight different speeds based on the analog input to the pump. In all cases the onboard controls are overridden and the external controller takes over. Unlike the Pentair pump, the Ecostar continues to display the pump running speed and energy use on the pump display when externally controlled. There are advantages and disadvantages to analog control. You gain flexibility because just about any automation product on the market can send the pump speed commands (even the basic GL-235 solar controller can change the pump speed). Unfortunately, the number of speeds is often limited by the number of available relays offered and available in the automation system. However, we can add additional speeds for pool service personnel or other needs with simple toggle switches. The Ecostar also comes in an SVRS model if needed. One nice feature is being able to mount the display remotely on a wall, or turn it to face any of four directions on the pump. 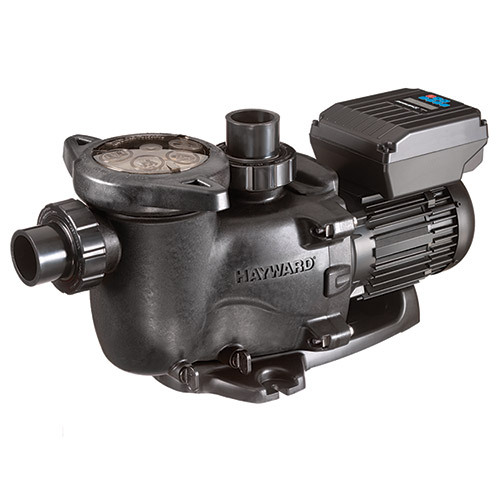 The Max-Flo VS is a 1.5 HP pump, which Hayward claims to be “right sized” for most residential pools. Unfortunately, the speed setting on the pump would typically be higher to achieve the same flow rate. Do you want your pump motor running at a higher speed, making more noise and possibly not lasting as long? To me, this defeats the purpose of a variable speed pump. Nonetheless, the Max-Flo VS could be a good option for some people with smaller pools and no heaters and limited features. I do not recommend it because it has absolutely no external automation controls. If you have existing automation or plan to add it later, this pump is not for you. Speeds and schedules are handled only through the onboard control, which has a digital readout for programming, convenience, and monitoring. The ePump 1.5 and 2.0 are named for their horsepower ratings. The Jandy products integrate well with Jandy automation (Aqualink), but can also operate independently. However, you need the Jandy ePump controller for independent operation, which adds substantially to the cost. In addition, you need the ePump contoller when using external automation, even though the functionality of the ePump controller is lost. 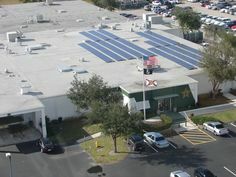 The external automation is accomplished with analog controls, similar to the Ecostar, and speeds controllable through automation may be limited. I do not recommend these pumps due to the cost and lower horsepower rating compared to the Pentair and Hayward options. The ePump controller can be mounted remotely from the pump like the Ecostar’s display module. Waterway, based in California, is located where some of the highest daytime residential electricity rates cause pool pumps to be a major household cost. The Waterway VSA uses a Champion motor and an AO Smith onboard controller. Like the Max-Flo VS, the Waterways VS cannot be controlled externally, severely limiting the functionality and potential savings for pools with features or heating systems. The control module may be mounted remotely. One nice feature is being able to control external equipment like a heat pump with a relay. However, this functionality is a bit backward to me – the pump tells the heater if it is running fast enough for the heater to start. External automation systems do it right, telling the pump to increase speed when heating is required. Like the Max-Flo VS, this pump is not for you if you want to operate a solar pool heater or heat pump effectively. This is a value priced pump with a seemingly good warranty. The Pentair VS and Hayward Ecostar are close competitors at the top. Both are powerful pumps with great external control options that depend on the existing or future automation system needs. The digital interface on the Pentair adds some nice capability at the cost of flexibility with non-Pentair automation. The Ecostar’s display mounting flexibility and ability to be controlled out of the box with just about any existing automation is great, although sometimes the number of speeds that can be controlled is limited. I cannot recommend the Jandy ePump due to cost and lower horsepower, but it has many of the Ecostar control features and works well with Jandy automation. The Hayward Max-Flo VS and Waterways VSA are only suitable for pool-only situations with no features or heat sources, and you will experience far less functionality and future flexibility. If you have a solar pool heater, and want optimum pool heating with external controls, forget about these last two pumps. A word of caution about installation and programming of variable speed pumps… You may see amazingly low advertised prices for variable speed pumps through discount retailers. Unfortunately, the initial programming of variable speed pumps can be daunting for the average homeowner, and properly setting up the pump to operate for various features and heat sources is not for beginners. In fact, it’s beyond the current capabilities of many pool professionals who are just coming up to speed (pun intended). Connecting variable speed pumps to existing or new automation products just further complicates the installation and programming. But most importantly when having a variable speed pump installed, ask your installer if they are going to install a flow meter! If they don’t, they are doing you a disservice. Installing a flow meter allows the installer to calculate the minimum speed possible to get the desired turnover, an also meet the flow rate requirements for optimum operation of solar pool heaters, heat pumps, cleaners, in-floor cleaners, and other pool features. The idea is to meet the flow requirements of all features of your pool and spa, and balance that with the amazing energy savings offered by any of the above variable speed pumps. If you see a price that is too good to be true, it is. You will be calling your pool service company (or me) to properly set up your pump. If a capable installer charges more that the competition, there is probably a very good reason. 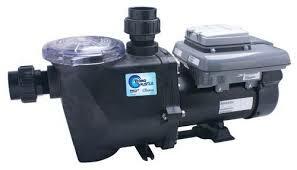 I can’t stress enough that you should not go for the cheapest variable speed pump and installer. That said, once the pump is set up and operating to your satisfaction, the system is simple, reliable, and will pay for itself in no time! I am in the market for a pump replacement. Data convinces customers more than words on the variable speed vs the two speed pump. Take two 2 Hp rated pumps, one variable speed and the other a two speed model. I would like to see a graph of power in watts vs speed in rpm for the variable speed pump and on the same graph the power consumed by the two speed pump at its two speeds. Which pump requires more power at the same comparison speed and how much is the difference? It sounds like you want to know the most important factor, which is comparing the energy consumption for the same flow rate. A variable speed pump will consume about 30% less energy for a given flow rate by virtue of the fact that it is a permanent magnet motor. That’s part of the puzzle. The other part is that 2-speed pumps rarely operate at the optimal flow rate. With a variable speed pump, you can dial in the exact flow rate needed. 2-Speed pumps are forever fixed to their two speeds. The exact energy savings is dependent on your situation and how you ultimately use the VS pump. I don’t have graphs handy, although they do exist. What I can offer is a good primer on why there is no comparison. Click below to download. Numbers don’t lie – you’re right. I can tell you unequivocally that I save $45 per month with mine, although I do have a very large pool. Most people see savings closer to $30. How do you feel about the (maybe newer?) Hayward Tristar VS? This is what is recommended by Hayward as the right product for my pool, but I can’t tell the difference between this and the Ecostar at all. Pool is about 30K gallons and we’re replacing a Hayward superpro 1.5HP. We have a heater we rarely if ever use. We also have a separate 1.5 HP pump that powers a pool fountain (jets), but I am hoping to see if I can’t replace both pumps with one VS. The TriStar is basically a lower powered EcoStar pump. With one less horsepower, you lose a lot of flexibility, and the pump will have to run at a higher speed to achieve the same flow, meaning more noise. Theoretically that also suggests a shorter motor life. I would not recommend this for most applications, especially if replacing an existing 1.5 HP single speed pump. The cost difference should also be very minimal. Looking at an EcoStar. i also have a hayward salt system. Is there a way to assure that the salt system is never on when the pump is off ? someone recommended aligning the timers, but you are risking them getting out of sync on a power outage. Cant really run the ecostar from a timer, i think it wants to be connected to line current. really need an output power line from the ecostar timer to power my salt computer. That’s no problem with an automation system with relays. The pump and chlorinator are simple placed on the same relay, schedule, or if the pump is controlled via low voltage cable, the chlorinator can be on a separate timed relay. Of course, there are no guarantees that the pump will actually run (to answer your question), but that applies to all pumps including single speed. What is your fear with the chlorinator being powered without the pump? And no, the Ecostar does not require line current. It can be on a relay/timer. I have old Hayward 2100 control system. What pupmp would you recomend? Will Pentair work with this system? I do not like Hayward policy on supporting old products. Thank you. Yes, the Pentair Intelliflo VS pump will work, but you need a Pentair Intellicom II module to act as the analog to digital interface. We use the Intellicom II frequently to adapt older Jandy Aqualink controllers to the Pentair pump. It works well, and as a bonus, you still get to see the pump RPM and power draw on the pump display – something you lose when connecting the Pentair pump to Pentair automation (except SolarTouch). i am in the process of upgrading my single speed to a VSP. Currently have the following: 12k gal, 18 pop up heads, water feature, water aerator, 1.5 HP single speed, 6 port actuator (no gauge), hayward 4025 cart filter system, aqualogic/goldline automation control (no longer a salt pool, cell is gone), and rev 2.66. I have no relays in aux1 or aux2, no spa, but do plan possible in the future to add a method to heat the pool via solar. I am leaning towards the ecostar (but for simplicity of controlling via the aqualogic), but also torn in choosing it over the pentair. In the case of the hayward, given the age and missing relays I would do a standalone install… doing a standalone always sways me to consider the pentair. My pool servicer is a firm believer of pentair over hayward for various reasons (e.g., reliability , service, etc). Any feedback is appreciated. Thanks. I would go with the Pentair it with an Intellicom II module for automation. You don’t need relays to make it work. This combination will be a similar price to the Hayward alone. One note: in-floor cleaners are the enemy of energy savings. They require a high pressure to operate. They also cause issues with solar sometimes. Bypassing them is a nice feature if your pool has this option. Regardless, you should save about 30% at the same flow rate you have now just because the pump is inherently more efficient. I’ve been looking at the Pentair Pentair IntelliFlo VS to replace my poorly design 2 motor system. 1.5 HP Pool & Heater motor, and a 2.0 HP SPA pump. To use my SPA, I need to run both motorsw, 1.5 for heat, and the 2.0 for bubbler jets. Looks like this Pentair will allow me to replace both pumps with one large pump. Please explain the automation components required to setup a ipad controlled system. I would like to have speed/energy feedback whenever possible. Operation would be a few hours at 25GPM to cover a sweep period, then the remaining hours to filter and circulate 1 to 1.5 turnovers per day. SPA operation would also need a output I/o to set valves to spa, and return to pool when shut down. Spa 3450 rpm – as needed. If you want iPad control, your best options are the Pentair Intellitouch (i5+3 should do it) with ScreenLogic interface or an iAqualink. The pump consolidation you are describing is possible about 90% of the time, and I like that strategy from an energy savings and simplicity standpoint. You will probably never want/need 3450 RPM unless you have serious pressure or 2.5 inch plumbing. Great article. I note your last section re: the installation of a flow meter. Given the low speeds that the Pentair pump is capable of operating at, what type and brand of flow meter would you recommend for this system? At very low flow rates, the accuracy of the flow meter is not really important. You won’t find a flow meter that is highly accurate throughout the very low flow range you might operate within. Because energy use is exponential with flow, you will be more concerned with the flow rate at the higher speeds. For example, you won’t see a sizable watt difference between 2 and 8 GPM (4x). However, the difference between 40 GPM and 50 GPM (1.25x) will be a much larger amount of power. We love the Flow-vis meters that integrate a check valve with the meter. They seem very accurate and they are made to last. The “guts” can be changed out later if necessary because the valve body is serviceable. They also make a retrofit kit that fits Jandy and Praher brand valve bodies. The other option is a standard 20-80 GPM meter with a stainless steel ball that gets clamped to the plumbing like a saddle after drilling a hole. I’ve found they are not the best long-term solution from a serviceability standpoint, and they are hard to read. The accuracy can be questionable, especially if not installed properly in a rather long length of pipe. Sorry for the confusion. Some pools have an alternative return path to the pool – either a spillover spa or wall jet – even a fountain. If you can open up a second return path to the pool, the in-floor cleaner will not work effectively, but the pressure will be much lower at the pump outlet and you can save a ton of money by turning down the RPM. Jason, i think i understand what you meant now. I do have a rock water feature. I have noticed that if I turn the manual valve entirely to its direction, the pop ups will not work (my guess is the water flow is directed entirely in the direction towards the water feature). I am not certain of the following, but I think when the valve is in this position, the skimmer nor the drain is pulling water. Does that seem right? Is it possible to use this valve as you described above? thanks again for your help. When you turn that valve you are returning water to the rock feature, which probably has significantly less back pressure than the pop-ups, so most of the water flow is not going to the pop-ups any more. That would almost definitely help you save energy with a variable speed pump – you can run at a lower speed to achieve the same flow. If you are only turning one valve, you are not changing the suction. The water would still be coming from the same place (skimmer and/or main drain. Jason, you seem to be very well versed on these pumps and accessories; help me a little. If I follow your information and lean towards the Pentair unit, do they have any similar priced offering to have remote control (wired or wireless.) I don’t need to be in the $50 range, but it look like Pentair would require components costing more than the pump, as a minimum. hope I’m missing something. The Hayward control can be mounted remotely by wired connection, and it is a cheap option, but I have never found anyone interested in actually doing so. One nice thing about that unit is you can turn the controls 90, 180, or 270 degrees for easy viewing. For true remote capability, you need an automation system. The best Hayward option is the OnCommand with Aquapod remote in my opinion. Pentair offers the SunTouch with a basic 4-function remote at a much lower cost, but we’re talking well over $50 – many times that. The remote has no feedback, but you can control up to 4 pump speeds. I have this at home and it meets all of my needs. I use it for two pump speeds, pool lights, and landscape lights. The next step up for Pentair right now is the IntelliTouch. There are lots of remote options, including Screenlogic control via mobile device or computer. You don’t want to pay for a “remote” for a pump. When the pump dies, you’ll be replacing the remote option in all likelihood. Get a good pool automation system if you truly need remote operation. Sorry for the double post. I did not realize that you had addressed my query in an earlier reply. Thank you. No problem. That Flow-Vis is really, really nice. It’s a bit pricey, but considering its a check valve, too, it’s not bad. Scotty here again – Jason thanks for trying to help, but Pentair just doesn’t want the DIY Homeowner. If I was in the Trunp income bracket, full automation, fountains, graphic displays, and all those other bells and whistles would be in line, buy myself and most other DIY homeowners want to get the value of the VSP and a simple but inexpensive remote or remote mounted control. Myself, I don’t want to go to the pool pad and flip a few valves, turn on the heater and pump, just to use the spa. Nor do I want to visit the pad to flush the SPA during cleaning. I have a couple electric valves, and mechanical system in place now – I design it, built it and it works great. I just want to add a VS Pump, and control it away from the pad. Transitioning to full digital automation becomes too cost prohibited, plus I lose control and simplicity. I can simply operate any valve independently (on or off), and if I select the SPA mode, it takes priority over any manual valve selections, plus runs the pump too. All this with a flip of one switch. Flip it off and I deselect the SPA, valves return to their required position, and the pump shuts off 20 minutes later (cools the heater) Not sure the Suntouch can come close to replacing this flexibility and ease of operation. Pentair VSP might be the best for Trump and friends, but Hayward has a valuable option to remote mount their control interface. Operation and programming can be done away from the pump. Yes, I’ve even tried to use the Pentair IntelliComm II, but they lack integration guidance, and I think it overrides all timers too. I guess the Ideal pump would be Pentair, but with I/O’s. Maybe 4 inputs for speed, and 4 dry output contacts as speed mode feedback. Or to remote mount their interface like Hayward. Unless I’m missing something, Hayward may be a better product. If you have an existing system to control valves and features, then you may not want a full automation system. Many people have spa-side air-switches to control valves and air blowers. Unfortunately, that will not ramp up the pump speed, but some people don’t want to lose the functionality of the spa-side control. The remote mounted pump panel may work fine for your needs. If you do not have automation and motorized valves already, the SunTouch is probably the most economical way to do it and control pump speeds and timers all in one. Theoretically, you could mount the SunTouch on your pool deck, but actuator and control wires would need to be run. I have no allegiance to any pump manufacturer. I have just found the Pentair to be a better product and more economical option in most scenarios. It’s also a more powerful motor (not that you will usually need all 3 HP on a typical residential pool). Since you’re starting with some automation already in place, it sounds like the Hayward EcoStar might meed all of your needs and be the most economical option. Does either Hayward or Pentair VSP have user signal to activate a relay for my salt system. If not, I assume we need to add in an small Automation System. I like the I/O suggestion Scotty made. How do we get this input to Hayward and Pentair? No, neither pump has an output. I am not aware of any pump that can trigger a relay with 24V output or with a dry contact switch. I have cobbled together many custom controls with relays and switches, but for the average consumer, why reinvent the wheel. There are automation systems that do it all. Basically, Hayward requires dry contacts to change speeds, and Pentair required digital input with the Intellicom as a bridge. Since Hayward is more expensive, both solutions end up costing the same. Beyond that, you have to look at the scenario. Jason, I have 15k gallon salt water pool with Jandy aqua pure 1400. System is 6.5 year old. Single stage 1.5 pump just died. Looking to replace with pentair intelliflo. Both for quiet use and some electric savings. I see references to the need to have pentair intellicom II as well. Is that needed? What will it accomplish for me? You only need the Intellicom II if you want to control your pump with a non-Pentair automation system. Some later firmware Jandy Aqualink systems can also natively control the Intelliflo pump. Jason, maybe you can help me with a replacement filter to go with my new VS Pump. Current filter is developing a drip (repaired freeze crack.) looking at a Hayward 325 sq ft vs. a Waterway 425 sq ft – similar price. It trust Hayward and existing is 325, but the larger 425 is Moore attractive……however, how good is Waterway. Is California – almost a 12 month season. Get a filter that is easy to service and has reasonably priced replacement cartridges. One of the top complaints, and reasons that people do not properly maintain their pool, is that the filter is hard to service. People also tend to stretch the life of their filters if they are costly, and lack of proper service causes filters to need replacement earlier. You might also consider that Hayward, a much more popular brand, may have many more aftermarket cartridge alternatives. I really like the Pentair Clean & Clear series, but I’m not sure they come in that size range. That’s about all I can offer on the subject. Jason, this is great information you are providing and it is hard to get elsewhere. I’m sure every one of us here really appreciates your knowledge on pool-related VSP questions. I recently installed a Pentair Easy Touch automation system and Intelliflo VS pump to work with my solar system on a 20K gallon pool/spa combination (no salt system) . I have 4 elec valve actuators…suction, return, solar (valve A), and skimmer/cleaner (valve B). I really wanted the option to control the skimmer and cleaner separate by automation since the previous compromise of setting the manual valve and running them both together really didn’t do a good job of either skimming or cleaning. In trying to balance all these demands and keep the electric costs down, I would like to be able to have my solar and cleaner/skimmer valves operate in sync at one appropriately ramped-up pump speed. In other words, is there a way for my automation system to also turn valve B to skimmer whenever the system senses that solar is available? I would also want valve B to return back to the position of partial skim/cleaner setting when the system gets the signal to shut off the solar valve. That would isolate my Hayward Navigator cleaner during solar operation so I wouldn’t have to run ADDITONAL RPM to run Solar and cleaner together. I can then run other programs/speeds during off-solar hours using valve B toward the cleaner position to get optimum results there..does this explanation make sense to you? If I understand your question, I’m pretty sure you will not be able to control valve B with solar and still maintain control of the valve otherwise. While I don’t think Pentair would support it, you could splice the two valve actuators together on the solar valve plug and operate them simultaneously, but of course you will lose the separate functionality of Valve B. There are ways to make this work with additional double throw relays, but these solutions are relatively complex and would not be supported by Pentair. You might consider calling Pentair tech support. They are pretty helpful when people have questions like yours. You are really knowledgable about pool pumps. My pump just broke this weekend. By the sound of my really old one speed pump I think the bearings are shot. I got 2 different companies to with one wanting me to replace it with a variable speed and the other who says standard pumps are more reliable. Company A insists that variable speed pumps don’t clean well. And save money only because the pump hardly moves the water. I was told since I have so much foliage the variable speed pump won’t move the leaves to the skimmer. Company B also told me that the variable speed pumps will automatically shut off if the water level is too low to avoid breaking the pump. I’m confused as to which pump to choose. Company A doesn’t know what they are talking about. Even at the same flow rate a variable speed pump will save 30% because it is inherently more efficient. They clean just fine. I run mine at a higher speed for a few hours a day to run my vacuum and get good skimmer action. It’s VARIABLE. Company A probably has had bad experience because of poor programming – you still need to get enough turnover, so calculating flow and time is important. Pay extra, get a better product, and hire someone who knows what they are doing. You will save in the long run. Sorry for the late response, Jason, but I appreciate your answer and I will contact Pentair directly, thanks. I have a question on Hayward Vs Pentair. Repair parts.. I have read a few accounts online of the “control” circuitry going bad and not being able to replace the motor controller. The weak link in these pumps appears to be the electronics in the control module. I know a surge protector is definitely a must that is not a guarantee of protection. Do either one (Hayward or Pentair) sell these controls as service parts? The electronics issues with early variable speed pumps have been largely corrected from my understanding. The motor controllers have always been replaceable. Individual components within the controls are not service parts, but the controller in total is available. If you have an authorized dealer install a Pentair pump, you also get a 3-year warranty to allay these outdated fears (60 days if purchased online or DIY). I’ve had my Pentair Intelliflo for almost three years with no problems and no fears. Jason, great article. 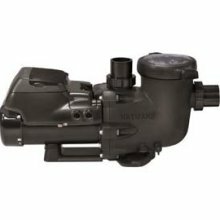 I’m in the market for a new pump and considering the ecopump, like the three warranty too, any views on this pump? How much should I be budgeting for a professional fit bearing in mind I have only an old pump with simple timer. EcoPump is not one that I reviewed, because it is NOT a variable speed pump (it is a 2-speed pump), and I would not recommend it. The pump is not readily available through traditional pool builder distribution networks, and despite their advance replacement warranty, you will still be days without a pump if you have a problem, whereas other brands are available off-the-shelf. You also get so much more for your money with other brands in my opinion. The Pentair Intelliflo, which is truly a variable speed pump, comes with a 3-year warranty also if installed by an authorized dealer, and the cost of the pump is similar. You get a 3 HP pump rather than a 2 HP (max with EcoPump) so you have more flexibility in rate of flow for a wide range of system pressures. Also, the EcoPump does not have a controller, so you would need to install a minimum of a 2-speed timer. In your situation, it sounds like the onboard electronic timer is the way to go. Regarding installation price, it varies widely throughout the country from what I understand, and you will get what you pay for. I’ve seen countless variable speed pumps installed by discount chains that simply install the pump and walk away with the default schedule and speeds active. The key to energy savings and performance balance, especially with heating systems, is a professional that will take the time to properly set up your schedules and speeds, and connect any new or existing automation systems properly. Hello Jason, you seem to be very knowledgeable and helpful. I have a 20K gl pool, but I believe it was set up in a funny way. It has 1.5 HP one speed pump for pool, a 3/4 booster pump for a Polaris, another 1.5 HP pump for spa jets, yet another 1.5 HP pump for a rock water fall. We bypassed ( cut out ) the heater since it was broken and we hardly use it. The Pool pump and the booster pump are ready to be replaced. I am looking at the Intelliflo VS pump, but it is 3 HP. Would that be way too much for my 20 K gl pool?Does it mean it will use 2x the energy than my old 1.5? Also, if I do end up with the Intelliflo VS pump, could I have the polaris plumbed to be operated by just the same intelliflo, instead of getting another 3/4 HP booster? I think for the pool company, it will be much easier for them to just replace both with 2 separate pumps and charge me double. So I want to get an un-bias opinion. The waterfall and spa pumps are still in working condition and are hardly used, so I plan to just leave them the way it is now. Any recommendations? Thank you! You can use the 3 HP (max) variable speed pump to replace any residential pool pump up to that rating. Since it is variable, you can adjust the speed to match the flow rate you currently have. At the same flow rate you will save about 30% because it is an inherently more efficient pump. The real big benefit comes from operating at a lower flow rate for a longer time each day. A pump running at double the speed uses 4 times the energy! Regarding you booster pump, it is very possible that you can replace both pumps with one. We do it often on pool-spa combos that use two pumps. It may require some plumbing and valves, but most likely it can work. This let’s you enjoy your features more often while keeping you pumping costs down. 2. My old 1 speed self priming pump sometime seems to have problem priming, maybe there are something slowing down the inflow. Will these IntelliFlow have problem priming … are they self priming? The XF is for commercial purposes where 2.5″ plumbing is required. It is typically not necessary for residential installations. The IntelliFlo pumps are self-priming. If you have a problem with your single speed pump, you probably have a suction leak issue, and using any pump at a higher horsepower (or vacuum pressure, really) will just exacerbate the situation. You would be well served to determine if you have a suction air leak issue. It may be in the filter pump itself at the gasket on the lid. Thanks a ton Jason. Appreciate you answering, even on Thangsgiving weekend!! No problem. Much to my wife’s dismay, I rarely quit working. Jason, Have approx 15,000 gal screen enclosed pool with Hayward DE filter and 1.5hp Hayward Northstar pump. 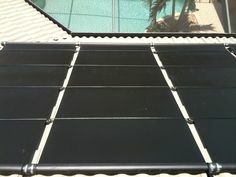 The pool has solar heat (single story)and Paramount In-floor cleaning system. Would a Hayward Ecostar or Pentair variable speed pump be a viable replacement for this system or would there be too many problems with this type of setup? Yes, either pump would work fine, however you will probably not realize maximum savings because the pump would likely need to run at a similar flow rate that you now have at all times. The pump will be inherently more efficient, so there will be some savings (20-30% perhaps). But DE filters and in-floor cleaners cause more back pressure, requiring higher speeds. The good news is that you will be able to dial in a speed that maximizes savings while providing just enough performance to make all of your equipment work effectively. I’m not a fan of in-floor cleaners (energy hogs, often don’t work well). Ideally pools would be built with a way to bypass the in-floor cleaner with a seperate low-restriction return. DE filters cause issues for solar pool heaters (high back pressure). Honestly, your setup is prone to issues, but a variable speed pump will maximize flexibility and performance. I would select a brand based on your existing automation (if any). Jason – the pool is screen enclosed and knock on wood – the in-floor system has worked flawlessly for years now. The good news is that when I had the pool built, as insurance, I had seperate returns plumbed in case I ever had problmes with the in-floor system. A Jandy valve has the returns on one side and the in-floor on the other so I could motorize the valve and ramp the pump speed up for the in-floor. Same issue with the solar – the temp sensor would open the valve for demand – but the vs pump wouldn’t know to increase the speed. I’m assuming the only way to do this would be with an automation system – correct? You made a brilliant move with the separate return that bypasses the in-floor cleaner. It was cheap insurance that is going to pay off. You could mount an actuator to your existing Jandy valve to motorize it, and with the right automation system, you can have that valve turn when solar is on. Better yet, just tie in the solar return on your cleaner bypass after the cleaner Jandy. That way, the solar has a low-resistance pathway back to the pool. You could set up the plumbing so that when solar is off, it runs through the in-floor cleaner. If you want to automate additional valves, especially in a pool/spa combo, the automation systems can get complex and expensive quickly, but there are economical choices like the SunTouch and Pentair’s new mid-level PL4 and PSL4 controllers. There are lots of ways to get the job done, and it depends on the specifics of your current setup. It sounds like you are very astute, but you may want to hire a professional that has added solar and automation to literally thousands of pools. Question now is how to program my Ultratemp with a Hayward Echostar SP3400SVP pump (I’m sorry I didn’t went with the same Hayward brand on the heat) which has a programmable panel. How can I set the Echostar to run on an automatic water heat so it will start my heat pump at the same time? I hope you’ll be able to help me with this issue. You will need an automation system to do this. The Hayward pump cannot control a heat pump and this heat pump cannot control a variable speed pump (at least without making unsupported modifications). For the two devices to work together well, you will need a system that tells the heat pump to turn on to reach a specified set point temperature and simultaneously tells the pump to run at a specified speed. Maybe I’m misunderstanding your question, but it sounds like you do not have any automated control system, and you need one. Something simple like a Pentair SunTouch controller will work. You will need some extra relays to control each pump speed needed when using the EcoStar. The EcoStar has analog inputs for use with other brands’ automation equipment. Jason. You are amazing. Never found anybody or any place where I found a faster and right answer before. And yes I dont have any automated system installed just because I dont have any other features hooked to the pump. Is just the 20k gls lap pool.Can you walk me trough the process? You mentioned I will need extra relays but where to install them? This is going to be a DIY project since I am putting it together in a Remote location. You will need a relay for each speed (except the normal filtration speed). The SunTouch comes with one relay that you will use to control the operation of your pump (it will be a high voltage AC relay controlling pump power). You can put up to three additional relays in the SunTouch. You will connect the line side of each relay to the common terminal in the pump, and the load side of each relay will go to the 1, 2, or 3 terminal in the pump. The pump manual has a chart that shows what timer speed will be activated on the pump with the different inputs are on or off. With all three additional relays off, the pump will run at the default filtration speed. With any or all of the other relays activated using AUX functions or solar, the pump will run at the corresponding timer speed in the pump. It’s quite complex. I’m not sure if that gives you enough information, but that’s the concept behind it. As a DIY’er, you will either have to have an intuitive understanding of circuits, or study the manuals for the SunTouch and EcoStar very carefully. Regarding the online reviews, the SunTouch does have a complicated user interface, which actually becomes quite easy once you understand what’s going on behind the scenes. I have to admit that it can frustrate the average consumer, but it is a highly capable unit, and therefore some level of complexity is understandable. The way schedules are entered is the hardest part for people to grasp and results in the most service calls. Regarding the quality, we have installed many hundreds, and replaced only a handful – the vast majority under warranty. As for the spa issue, if set up properly, the up button on the SunTouch engages the spa circuit just like a spa button on the optional remote. I bought an older house with an existing in ground pool. it is a relatively large pool 18X40 feet. 3 foot down to 10 feet. It only has one skimmer and one return pipe for water return. The water was clear as long as we kept up with the chemicals. Last summer a leak was diagnosed and the first “pool contractor” tried to seal it with a leak sealer which did not work…Metal pipes. Now I have people quoting me all kinds of different prices 20K- 40K to repair replaster and replace. I want a new poll filter, new pump( do I need variable speed? ), I want to add a Polaris system. @James: Unfortunately, your questions go well beyond what can be answered in an online forum. You are going to have the trust the opinion of a pool professional that can look at your situation and guide you accordingly. Jason. My Ultratemp is rated 42Amps and max protection of 70Amp. Should I use a 60 amp double pole breaker on the load 204volts circuit? The electrician left a double 20 and first time I turned it on, the breaker tripped. If you are asking that question, PLEASE hire a licensed electrician. Your wire size is probably too small. You can’t just change a breaker rating. I don’t want you to burn your house down. Thanks again for your help. I just called a friend who is a retired electrician and he recommended just to use a double 50amps breaker and it works perfect. Now I have issues with the heat pump location and will need to relocate it because I installed it on a equipment room that house all my pool equipment,but seems to be too close and cold so the HPump doesn’t have enough recirculation air to get the warm air it needs. So the air blowing from the fan gets too cold resulting in a high condensation on the heating pump. And regarding the automated I will read more about the different alternative. Total newbie. Have a 13.5K gallon pool/spa with spillover. The spa has a separate pump to control the jets. The “pool” pump broke and I would like to go with a VS model. This pump contols the pool and sends heated water into the pool/spa. the controller is a Jandy rs$ from 2005. The spa has spa side controls and there is an in house button controller for the Jandy . I know I’m not explaining this right but I’m trying. HELP! A Jandy RS system that old will not control a variable speed pump via digital control, so you should consider a Pentair Intelliflo with an Intellicom II interface module. You can set this up to change the pump speed in a variety of scenarios, including when the spa turns on. However, since you have a separate spa jet pump, you may not need to change the pump speed during spa operation. Actually, you may want to change the way your pool and spa are plumbed altogether and just have a single powerful pump. You would need a pool pro to see if that is possible and advisable. I am looking into upgrading to a VS pump on my solar heated, salt water pool. I currently have a WaterCo HydroStorm 1.5HP (240v) pump (I believe Australian made). The chlorinator is a Compupool chlorinator and is only 120v and it is attached to a single side of the output to the pump, so it only turns on when the pump is running. I also have solar panels on the roof for heating the pool water. The solar heater controller is a ComPool LX-220 and it simply controls a diverter valve via a +/- 24v signal to the valve. If I install a VS pump, I can see having the low speed active when the solar is turned off, and only needing a higher speed when the solar control valve is re-routing the water flow to the panels on the roof. Will this be able to be done (using the 24v signal) or will I need to completely replace my current timer with something new? Rick: You can make it work with the proper pump and relay(s), but in your case I recommend upgrading to a SunTouch controller or something like that. I’ve never put an Intellicom into a Compool box before, but I think there is room to do it. That 24V you are talking about isn’t a “signal.” That is a current carrying circuit to drive the motorized actuator. It carries about 24 watts, so it’s definitely not a simple control wire. The disadvantage of this is that all other speeds on the EcoStar would be inoperable. We get around this by installing a toggle switch to toggle a third “cleaner speed” for vacuuming. Hi Jason! I have a very similar setup to john m (above) with a pool/spa with spillover. Main pump is a 1.5hp hayward single speed that controls in-floor cleaners and skimmer/filter. The spa has a separate 2hp hayward pump that only controls the jets. The controller is a Jandy RS circa 2003. 1. INSTEAD of purchasing an Intellicom II, can I purchase an iAqualink upgrade kit (such as http://www.poolsupplyworld.com/Jandy-IQ900-RS-iAquaLink-Kit-with-RS-PCB-Upgrade/IQ900-RS.htm) which would give me cellphone/tablet control? 2. Can I still use the my wall mounted control Jandy control unit in addition to control using the phone? 3. If I purchase a Pentair VS online and have a local pool guy install, do I get the longer warranty or do I have to purchase it through a local pool guy? 1. If your Aqualink is that old, I think you need the IQ20-RS upgrade kit. Check with Jandy, but I think the reason is that the IQ20-RS comes with both the board and chip replacement. 2. No, the wall mounted control will not be compatible with the new control board (side note: any wireless PDA control that works with the old board will not work with the new board). 3. If you buy it online, you get a 60 day warranty, period. You have to buy it through a retailer to get the 3 year warranty. Also, local pool guys don’t like installing equipment supplied by others for several reasons. Most importantly… let a guy make a buck – you can’t support a family by working for wages. These guys have to make a few bucks on marking up the materials a bit. I noticed you wrote that you have in-floor cleaners. I am really not a fan of those things. You will have to run your VS pump at the 1.5HP rate to make the cleaners effective (or something close to the pressure for which your pool was designed. They require a lot of pressure to operate properly. More pressure/flow means more energy required. What I recommend is that you run your pump at a lower speed most of the day and then ramp up the pressure for a couple of hours ech day to make the cleaners effective. There isn’t much you can do about this issue unless you have a separate pool return that does not go through the cleaners. Pool builders would be smart to include this bypass feature. Update: I think the IQ900 will work, but it will not upgrade to the latest iAqualink version. Check with Jandy on that. I am looking to replace my 2hp Challenger High Flow pump MOTOR and understand that the wet end I have can still be used. My pool has little or no automation, other than the standard trip timers. My Polaris 380 has its own booster pump and I assume as long as the VS main pump is running, the booster also running wouldn’t be a problem but that is a question. I’ve seen the Jandy offering with a huge basket etc. but figure most of that oversize is just hype, as long as my existing baskets aren’t blocked in any significant way. See any obvious problems or issues to be aware of? I am considering the Ecostar motor based on your comments above. Pros or cons? BTW- I do have a spillover spa, total gallons of the system = 17500 gals. Also a fountain but it has a separate pump and on / off control. The EcoStar and other pumps listed here are not available as separate motors and drives. Well, technically you can buy them as parts, but it will cost pretty much the same as a complete pump unit. I’m not sure it would work anyway with your existing wet end. There are a couple of bolt on variable speed motor/drive combos, but I have yet to find one I can recommend enthusiastically. My recommendation is to bite the bullet and replace the whole thing or wait until your existing pump goes. As for the spillover, you will obviously have a less satisfying waterfall effect at lower flow rates. That’s where automation is nice, because you can schedule spa operation at higher flows for shorter periods of the day. It opens up a lot of convenient options. Jason…thanks for the quick reply. Just to clarify, I don’t want a separate motor from controls, I understand they come together as a unit. Any idea on how to definitively confirm or deny whether my wet end would be compatible with any of the motor/controller units you discuss? What is it about the available combos that are available that make you unenthusiastic? I currently have a Jacuzzi 1 HP motor (14 years old). Jacuzzi Sand filter, Raypak heater and one small water feature. ~25000 gal pool. I am planning on replacing the pump with a VS pump. Looking at the Pentair pumps. Would a 1.5 hp VS pump be sufficient? Any reason to (or not to) go to a 3HP pump? ISs there a big difference in the intellflo vs superflo? recommend one vs the other? Any other besides Pentair that your would recommend higher? A 1.5HP would certainly be sufficient in terms of being able to move enough water, but in my opinion you should go with the higher rated HP pump. You will be able to run the Intelliflo VS at a much lower speed to achieve the same flow rate, which means far less noise, and presumably longer life. If you are looking strictly at energy savings, I read recently that the Hayward Ecostar is slightly more efficient, but the street price is a bit higher. I am a fan of the Pentair Intelliflo. I use one on my own pool, and can recommend it confidently. I am in the process of installing a pool solar system myself. I am pretty comfortable doing most of the work (with some help of friends in the solar/roof industry). Our pump went out on our pool so I have to replace it anyway. I am sold on the variable speed pump (besides all the features, energy efficiency and cost-savings, I also get a $200 rebate from our local electrical utility). I have a 35,000 gallon in-ground pool and will be running over 400sq ft of solar panels (located 150′ from the pump). My pump that went out was a Sta-Rite 1 Hp. I would like to have my pump and controller be fully automated (don’t necessarily care if I can access with iPad – just talk to one another and adjust the flow to and from the solar to keep the pool at an even temperature.). Should I replace it with the IntelliFlo VS (3 HP)? What controller should I order? Depending on features, I would normally recommend the Pentair VS 3HP with a SunTouch controller. More details on water bodies and plumbing would help. Pictures are even more helpful. I have a small pool (6000 gal), would a vs pool pump be cost effective on such a small pool? Simple pool no bells or whistles just to pump the water enough to change the water twice in a day. Your payback time would be pretty long in all likelihood, but it may be worth doing it, but I would probably wait until your existing pump goes. There are lots of questions, like your existing pump specs and pool features. There are some lower cost, lower HP pumps now available that you might look into, like the Superflo VS.
New to the pool life, bought a house in Miami with a avg sized pool of 25K gal. My single speed pump went out and i want to upgrade to a VS pump. I have a Hayward saltwater chlorinator and a hayward sand filter with DE media. Would a Pentair Intelliflow pump work with the Hayward chlorinator? Also what is your stance on DE media vs. sand when using a VS pump? PS- The pool is not screen enclosed, leaf drop is common. The plumbing is older 1.5″. I’m considering replacing it to 2″ when the patio gets redone. Yes, the Intelliflo will work fine with the chlorinator. The two work independently. You just need to make sure the pump is programmed to provide adequate flow for the chlorinator. Neither DE nor Sand are an energy efficient choice. Both produce more head pressure than cartridge filters, so a higher pump speed is required to meet a given flow rate. Your old, smaller plumbing adds to that issue. Replacing plumbing aboveground will help a bit, but I doubt you are planning to replace underground lines. You are stuck with what you have, so if you have an opportunity, I’d ditch the filter in favor of a low head loss option like the Pentair Clean and Clear. 25k gallons is far from average in Florida. 15,000 is probably much closer to average. Your leaf issue will be a challenge. Frequent pump and skimmer basket cleaning is important. A secondary leaf trap on a suction cleaner line may help. Jason, I measured my pool and it’s 16K gallons, as opposed to what I mentioned earlier. I have a hayward filter with Zeobrite media. The plumbing is 1.5″. I don’t have any automation, just a Hayward chlorinator. Would you recommend a Pentair Intelliflow or Superflow pump? I have a 16K gallon pool, outdoor no screen with 1.5″ plumbing. Is a Intelliflo an overkill? Out of the two Pentair pumps, which would you recommend? I also have Zeobrite instead of sand in my filter. Would like to know your though? Hello, I’m new to pools. We have a built in apx 28k gallons. We just had our main pump motor fail. It’s an older 1hp magnetek century. Then it also uses a 3/4hp a.o. Smith booster to run the sweep. Both pumps are on separate timers. I’d like to know if I could replace both pumps with one 3hp variable speed with some kind of auto valve to run the sweep when needed? Any other info you think might help would be great. Thanks. Absolutely. With the right pump and automation you can achieve the right flow and valve control for every feature. There are some situations where two pumps are best, but one pump is sufficient for most residential pool systems. Thanks, I have no dought I could install it. I’m just not sure if a pump like pentair super flow would work? Or which valve to use or how/what timer to use for the valve? Thank you for this information. I’ve been trying to get answers to my questions and I have yet to find a clear answer. I live in Miami and have a pool that is appx 20,000 gallons. I have a salt water generator and a heat pump. Pool has a small waterfall, side vac for the cleaner, and two skimmers. Original pump was 1.5 HP single speed and was here when we bought the house. It just went out. I had a Pentair 2VST installed by the company that provides our cleaning service. I was under the impression (based on everything I’ve read online and a discussion with someone in mechanical at the pool service company) that the new pump would be on a schedule, determined by which feature was being used (cleaner, SWG, heater, only circulation/skimmers). However, the installer told me he would keep the pump on the same 10am – 6pm schedule the old pump was on – using the mechanical timer – and the difference would just be the RPMs could be more dialed in on the VS pump. When I mentioned the schedule, he said those schedules do not apply to Miami due to the heat and humidity, as well as the sun exposure with our pool. I’ll probably still be happier with the VS and there will be some savings I imagine as it should be more efficient, but I wish I could get a more definitive answer on this scheduling question. In summer, we do not need the heater. The cleaner only needs to run for two hours in the morning. I figure a summer schedule would be 10am-12pm enough rpms for cleaner (this would also run SWG) 12-4pm enough RPMs for SWG (should also pull through skimmers) and then 4pm – 10am enough RPMs for circulation or shut off at some point. This would be slightly modified for the heater during the cooler months. A flow meter was not installed. Does the installer just not want to take the time to program a schedule? Or is he right that I should just run it from 10am-6pm at a high enough RPM for the cleaner, which would then be high enough for everything else (heater, etc) and leave that schedule year round? I should add that I could do 4pm-8pm enough RPMs for the waterfall feature and then either have it shut off at 8pm or have low RPMs for circulation until whatever time in the morning. Another question I have is the valves for side vac, skimmers, and jets. With the VS should they be all open all the time? With the single speed, I would sometimes pull the cleaner and close the side vac so the skimmers could do more work. First off, per the manufacturers installation instructions, the pump is supposed to be directly wired with power 24 hours a day. That can be accomplished by removing the pins from a mechanical timer and leaving it on all the time. You should really use the schedules within the pump to schedule all run times and speeds. We hear this nonsense all the time from pool service companies about variable speed pump not working in our hot climate. It all comes down to proper programming. You need to achieve proper turnover on your pool. You should run your variable speed pump for an extended period of time at a slower speed. You can increase the speed for a short time each day to make your cleaner effective and increase the turnover rate. My pool is very similar I have a 24000 gallon pool with two cleaner ports and two skimmers. Right now I am running my pump for 16 hours at 1300 RPM, and at 2600 RPM for 2 hours each day to make my suction cleaner effective and increase skimmer effectiveness. Everything will be different based on restriction and flow for a given pool. Your speeds and times may vary. You made an excellent decision on selecting system, but it sounds like you should take the reins in programming the pool pump properly. With regards to your valve positions, I would close the main drain, leave The cleaner full open, and adjust your skimmer valve for effective operation. Focus on a high speed that makes your cleaner operate well. 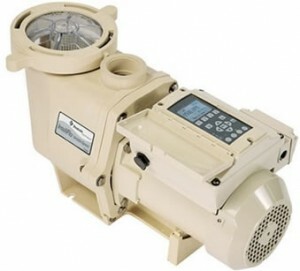 You may also want to check out my new blog’s page on comparing variable speed pumps. Wow! Thank you for the prompt response! What are the times of your speed schedule? And do you agree that during the time of the year when the heater is needed, I would need to increase day time RPMs so the heater has enough flow? I don’t know which valve is my main drain, but I will experiment and find it. The programming part that does confuse me is the right amount of RPMs and time for the SWG so the levels are correct for the pool. I really don’t want to get into taking readings on my own – that’s why I pay the pool service! I’m going to talk with a supervisor there and explain how I want the VS scheduled. They should work with me. I change my pump speeds throughout the year, but I usually run it 16 hours a day and then boost the speed for a number of hours in the middle of the day depending on the time of year. You may also want to check out our new video comparison.